When he was finally rescued from the wreckage of a British Midland jet after the Kegworth air disaster, Stephen McCoy was given little chance of survival. His injuries were so severe he did not regain consciousness for 18 months and he spent the next three years in hospital. 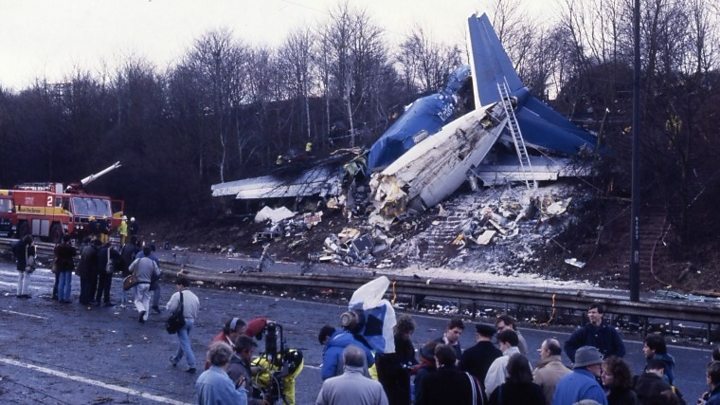 The crash happened on 8 January 1989, after a Boeing 737 developed a problem in the left engine, shortly after leaving Heathrow for Aldergrove - Belfast's main airport. The pilots shut down the wrong engine and the plane crashed on the M1 in Leicestershire - just short of East Midlands Airport, where they were attempting an emergency landing. Forty seven of the 126 people on board were killed; 74 were seriously injured. At the time, Stephen was a 16-year-old boxing champion and a keen punk music fan with spiked, bleached hair. When he eventually got out of hospital, his sister Yvonne gave up work to become his full-time carer at their home in Toomebridge. Thirty years later, Yvonne remembers that it was hours after the crash before they were told that her brother was still alive. "The sight I saw, I would not wish it on anybody, he did not know anybody, he was in a coma. He was thin, lifeless, with a massive dent in the head. "I was with him on the day he came out of the coma and it was the best day of my life." Rose McCoy, Stephen's mother, recalls how slow the process was. "He started to come out of the coma bit by bit and he would have pulled himself up and looked all around him, but if you'd done that (she waves her hand in front of her face) he would not have blinked, he would not have known you were there, he just was trying to get out of the coma," she said. Stephen was left with brain damage and paralysis down one side. Brendan Heffron, a teenage friend of Stephen's, said what happened shook both teenagers badly. They shared a passion for punk, and Brendan still stays in touch with his friend. "It is sad to think he could be married and should have kids," said Brendan. "The rest of us just basically got on the same way about our trades, our businesses, raised our families. Stephen was pretty much the same. He was very like-minded with the rest of us." Yvonne said that, despite the crash, Stephen still flew to Lourdes every year. "Stephen's faith is extremely strong. His faith has grown since the accident and he takes a regular trip every year in July to Lourdes - that is the highlight of Stephen's year. "Every year that he goes to Lourdes he has to get on a plane, but Stephen is very brave. "He says 'this plane is not going to crash', because he puts his faith in God. Stephen said: "I'm able to pray and meet people and friends I have met before and get on well with. It gives me great hope to hurry up and get out of this chair for good." Stephen still uses a wheelchair, but has recently been working towards being able to walk, using an exoskeleton to hold him upright and propel him forward. Physio Kim Gregg, who is helping Stephen, described him as "the ideal patient". "He has a zest for life and a zest for improvement," said Kim. Despite the setbacks over three decades, the family has never given up hope for his recovery. "I always had hope, which is amazing, because the knockbacks that Stephen has had, he never, ever lost hope," she said. "But you always have to have hope. If you have no hope you have nothing." Stephen McCoy My Fight to Live is on BBC One NI at 22:40 GMT on Monday 7 January.